Step 1: Candidate identifies an Evaluator and arranges to perform test in person, or confirms that test can be evaluated via video. Email skills@nationaltreibball.com for help finding an Evaluator. Step 2: Candidate and dog complete certification exercise in presence of Evaluator, or submits video directly to Evaluator. 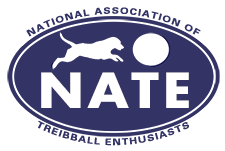 Step 3: The Evaluator sends email to skills@nationaltreibball.com (with copy to the Candidate) to advise NATE that a test has been passed.  The Subject of the message should indicate the last name of the Candidate and the call name of the dog.  The body of the message should document the name of the dog, the date of the test, the Skill Category and Level (e.g. Distance, Level 1). Step 4: The Candidate completes a Skills Certification Submission (including payment) online (Members Only section, Skills Certificate Submission). Step 5: NATE receives Evaluator’s email and Candidate’s Submission. Step 6: NATE sends Certificate to Candidate via email. Step 7: NATE posts achievement to NATE Members Facebook page.